How can your science department become a site for developing science teachers’ professional learning? Building the Science Department answers that question through stories from teachers who walk the sometimes rocky path of reforming science teaching and learning. 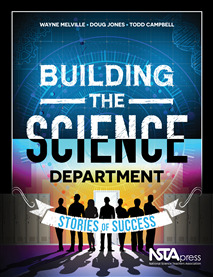 Written by the authors of Reimagining the Science Department, this resource features vignettes from teachers at different career stages. Drawing from these stories, it highlights the common themes in their professional learning and the ways their learning needs have changed over time. The stories are illuminating for teachers as well as for school administrators and other education leaders. The book is divided into two parts. The first part deals with scientific activity as represented in A Framework for K–12 Science Education and the Next Generation Science Standards and its role in making the science department a place for building professional learning. The second part uses teacher vignettes to work through the components of a professional learning framework—context, content, activities, and processes. After each vignette is a commentary on the teachers’ key points and their implications. Also included are questions to challenge teachers to improve their instructional practices and align them with current reform initiatives.